The Texas 2010 primary elections are just around the corner. The Democrats have already taken over the nation and want to do the same to Texas! 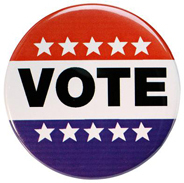 Do you part as a Republican, and get out there and vote! The following chart lists all the Texas positions that will be up for election in 2010. All 32 U.S. Representatives 2 yr.
Comptroller of Public Accounts 4 yr.
Commissioner of General Land Office 4 yr.
Commissioner of Agriculture 4 yr.
All 150 State Representatives 2 yr. Various Court of Appeals Justices 6 yr.
Family District Judge 4 yr.
All Criminal District Attorneys 4 yr.
All County Judges 4 yr.
Statutory County Court Judges (*) 4 yr.
All District Clerks 4 yr.
All District and County Clerks 4 yr.
All County Clerks 4 yr.
Precincts 2 & 4 4 yr.
(except those with a place 1 designation) 4 yr.
(*) County offices that were created by the Legislature or by Commissioners Court that were effective for the 2008 election will not be on the ballot in 2010.